The Best Finland Travel blogs from thousands of top Finland Travel blogs in our index using search and social metrics. Data will be refreshed once a week. Finland About Blog Gofinland offers all of Finland's rental cottages and the most interesting holiday experiences under one roof. All about how to travel to Finland, how to get around, and what to see and what to do. Facebook fans 4,115. Twitter followers 596. About Blog Tourist and Convention Bureau Visit Turku offers versatile tourist services in the heart of Turku. Visit Turku maintains tourist information and portal, publishes leaflets and campaigns, rents cottages and bicycles, organizes excursions and sightseeing tours, carries ticket and hotel packages, sells souvenirs and other Turku products. Facebook fans 42,532. Twitter followers n/a. Länsi-Uusimaa About Blog Visit South Coast Finland is a tourist region between Helsinki and Turku. Events, cultural sites, food and activities are all collected at the site's site. Facebook fans 2,328. Twitter followers 115. Mountain View, CA About Blog Comprehensive up-to-date news coverage about Finland Travel, aggregated from sources all over the world by Google News. Facebook fans 1,041. Twitter followers 214,489. Facebook fans 490,190. Twitter followers 59,690. Facebook fans 705. Twitter followers 254. Rovaniemi, Finland About Blog Lapland Welcome is a program service company authorized by Finnish Competition and Consumer Authority. Our safari office is situated in Rovaniemi city. Our most popular programs are snowmobile-, husky-, reindeer and Northern Lights programs in the winter time and midnight sun- and wildlife safari programs in the summer time. Facebook fans 6,312. Twitter followers 106. About Blog Official travel guide to the region of Central Finland - the Sauna Region of the World. The region of thousand lakes, saunas and incredible views - Central Finland is a place to enjoy the true beauty of the Finnish nature! About Blog Helsinki Tourist Information and Travel Guide. Travel Reservation, Hotel Accommodation, Car hire, Attractions in Helsinki, Finland and more. News and analysis on Helsinki and Finland current events. Facebook fans 475. Twitter followers 267. Facebook fans 683. Twitter followers 1,623. Helsinki, Finland About Blog We are Rimma and Laura, friends and adventuring moms from the woods of Finland. We share a passion for nature, photography, writing, traveling - and of course Finland. This blog is our tribute to this native land of ours. You are warmly welcome to fall into Finland with us! Facebook fans n/a. Twitter followers 414. 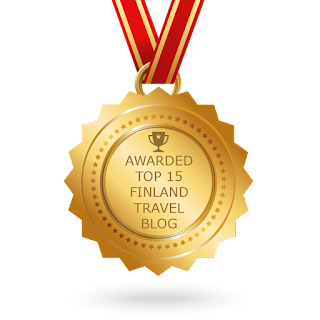 CONGRATULATIONS to every blogger that has made this Top Finland Travel Blogs list! This is the most comprehensive list of best Finland Travel blogs on the internet and I’m honoured to have you as part of this! I personally give you a high-five and want to thank you for your contribution to this world.